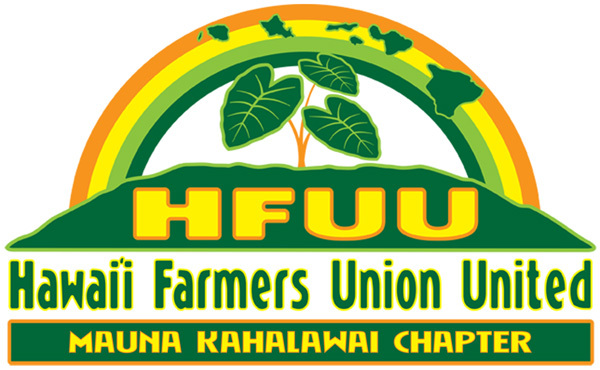 The Mauna Kahalawai chapter of HFUU generally meets the 2nd Thursday of each month in the Mill House at Maui Tropical Plantation..
February 2018 news from the Mauna Kalahawai chapter of Hawai'i Farmers Union United. 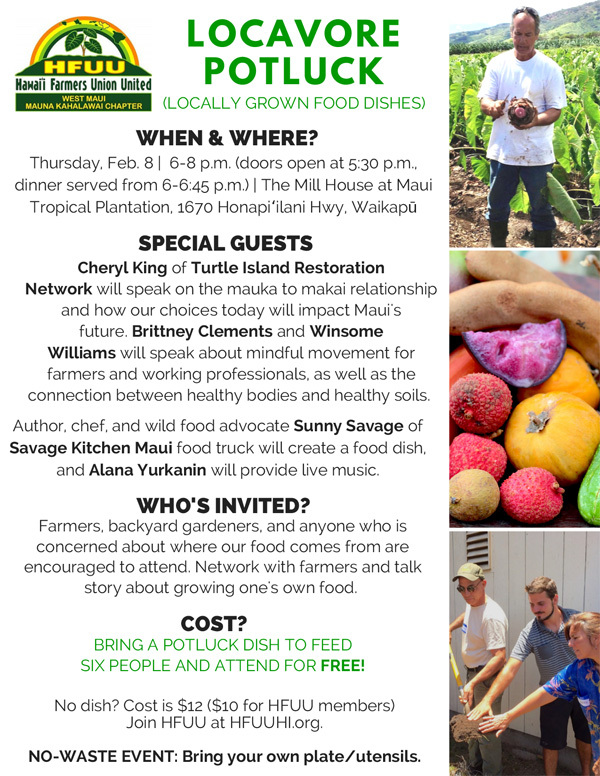 Hawai'i Farmers Union United, Mauna Kahalawai Chapter presents its monthly locavore potluck from 6 to 8 p.m. (doors at 5:30 p.m.) Thursday, February 8th - in The Mill House at Maui Tropical Plantation, 1670 Honoapiilani Hwy. Mauna Kahalawai Chapter meets the second Thursday of each month. Cheryl King of Turtle Island Restoration, who will speak on the mauka to makai relationship and how our choices today will impact Maui’s future. Brittney Clements and Winsome Williams will speak about mindful movement for farmers and working professionals, as well as the connection between healthy bodies and healthy soils. The evening will also include a locally grown food dish by author, chef and wild food advocate Sunny Savage, plus live entertainment by Alana Yurkanin, prize giveaways, networking, and more. You don’t need to be a farmer to support Hawai'i Farmers Union United. Anyone who is concerned about where our food comes from is welcome. Come network with local producers and talk story about growing one's own food. Attendees are encouraged to bring a dish to share (to feed six people). Otherwise, cost is $10 for Hawai'i Farmers Union United members; $12 for non-members. This is a waste-free event. Please bring your own plate and utensils, or they will be provided for a fee. You may become a member at the event, or by visiting HFUUHI.org. Annual membership is $50, or $100 for a family of four. BECOME A LEADER—JOIN THE MAUNA KAHALAWAI BOARD! It’s time for our annual board elections, and I would like to invite any interested Mauna Kahalawai chapter members to run for one of these leadership positions. The election of our 2018 Mauna Kahalawai board and delegates will take place at our monthly locavore potluck meeting on Thursday, March 8 at The Mill House at Maui Tropical Plantation. If you are interested in being on the Mauna Kahalawai chapter board, or in being a 2018 chapter delegate, please email lehia.apana@gmail.com. JOIN US AT AG FEST! HFUU Mauna Kahalawai chapter is thrilled to have a booth at the Maui County Ag Fest on Saturday, April 7 at Maui Tropical Plantation. Have produce to sell? Member farmers are welcome to add their bounty and sell their goods at our table under the Maui Farmers Market tent. We’re also seeking volunteers to join us at the booth and represent our organization. For details, contact Irene Plunkett-Mina at iplunkett@msn.com. PROTECT POLLINATORS BY USING NATIVE AND LOCAL PLANTS! Maui Nui Botanical Gardens in Kahului will host a Horticultural Workshop at 9 a.m. on Saturday, February 10th. Maui Master Gardener Coordinator, Dr. Cynthia Nazario-Leary, will teach participants how to protect and provide for pollinators using native and local plants. A planting activity will be included, and participants will take home a free native pollinator plant. The workshop fee is $25; or free for MNBG members and Maui Master Gardeners. For reservations, email info@mnbg.org. LET'S CROSS POLLINATE—SUPPORT TURTLE ISLAND RESTORATION NETWORK! Here at HFUU Mauna Kahalawai, we’re passionate about building a vibrant and prosperous farming future for Hawaiʻi. At the heart of this mission is a deep desire to support the symbiotic health of our ʻāina from mauka (towards the mountain) to makai (towards the sea). We all know that what happens on land directly affects the health of our oceans. 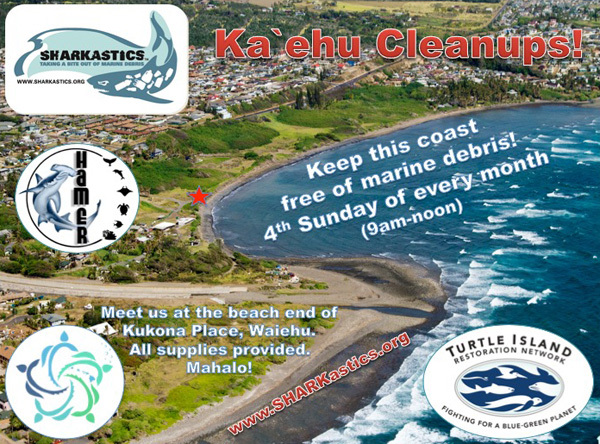 Become part of the solution by joining the monthly beach cleanup from 9 a.m.-noon on Sunday, March 25 at the beach end of Kukona Place in Waiehu, hosted by Turtle Island Restoration Network. Remember, we’re all stronger together! Join other HFUU members to kōkua our island home!